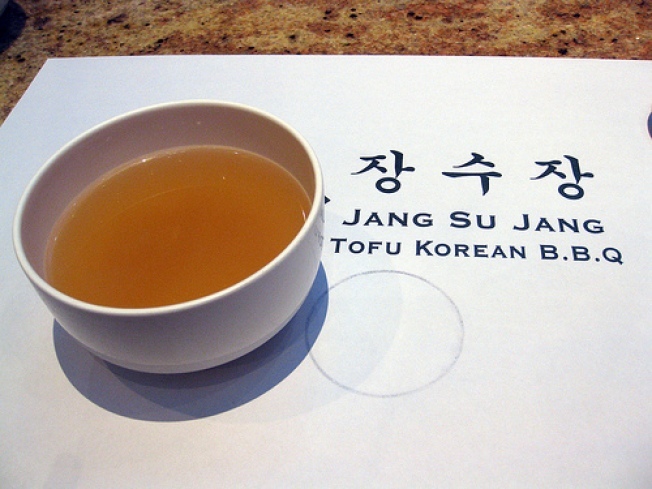 Soup at Jang Su Jang. These days, I rarely venture into the South Bay. It’s a shame, because I absolutely love Korean food and Silicon Valley is home to some of Northern California’s best Korean food. As soon as we sat down, our super friendly waitress covered our granite table with bowls of broth and an array of banchan, the Korean small plates and kimchi that are eaten alongside a meal. I was in heaven with the crunchy daikon, the sweet potatoes, and vinegared seaweed. For my entree, I chose one of my favorite Korean dishes: bibim naengmyeon. Made up of long, thin, chewy noodles and served cold in a stainless bowl, my favorite naengmyeon variation is bibim naengyeon, which includes a generous serving of gochujang, a savory and pungent hot chili paste. The whole thing is topped with pickled radish, cucumber, a boiled egg, and cold sliced beef. The noodles in this case were a little bit overcooked but the sauce was incredible and I couldn’t stop myself from finishing the bowl. Despite the label, our mystery dessert wasn’t frozen. It was liquid, very sweet and slightly grainy, and I have no idea what it was made out of. It was an curious note to end our meal with, though. Jang Su Jang is a solid restaurant: the food is delicious, the service is very warm, and the ambiance is modern and sleek. I know where I’m going the next time I visit the South Bay.